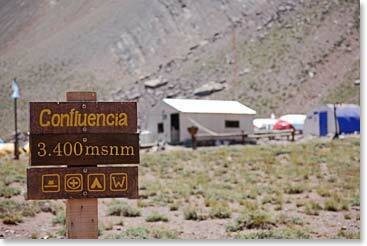 Today we woke up ready to begin our Aconcagua expedition. At 10am under blue skies, we left our comfy hotel in Los Penitentes with our sights on Confluencia camp. 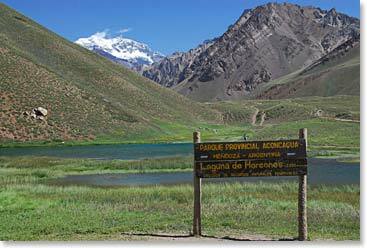 Our day started with a drive to the Aconcagua Provincial Park gates where today’s trek began at a beautiful little lagoon. We walked along the Horcones River on a good trail and our team doing well. Maggie got off to a slow start today, but quickly found her stride. Todd is the strongest in the group and thankfully he is patient. The entire team has now arrived at Confluencia Camp at 11,000ft/3350m where we will spend two nights acclimatizing before we climb higher up Aconcagua. Everyone has their own private tent, so we are living in style! It was a leisurely 3.5 hour hike today along the Horcones River and it was even accompanied by music from Maggie’s iPod and speakers. Things are going great, we’re having a good time and we’ll keep you posted as we continue to climb higher and work on our acclimatization on Aconcagua. Aconcagua greets us as we enter the provincial park sharing its name. 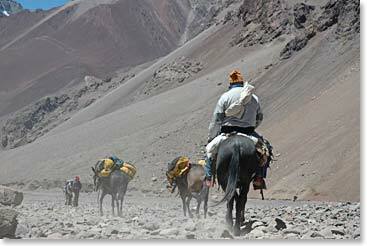 Working hard and carrying our gear, the mules lead the way up the dusty path. We arrive at Confluencia camp where we will spend two nights.